MoonMarble.com - Filip Vogelpohl - "Planetary II Vortex Marble"
Art Glass → Contemporary Handmade Marbles → Filip Vogelpohl - "Planetary II Vortex Marble"
This is a handmade marble by artist Filip Vogelpohl. 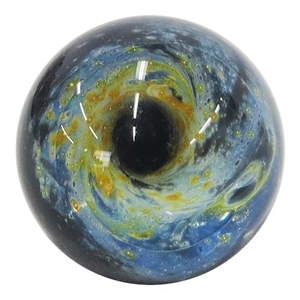 This marble features a spacey swirly design that funnels down into the center of the marble and appears to go deeper than physically possible. The back is decorated with a black and crescent moon design. Measures approximately 1 5/8" in diameter.